Ald. 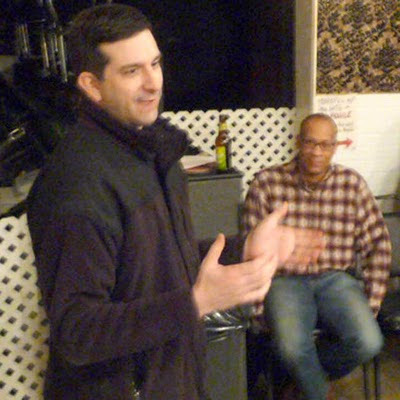 Scott Waguespack meets with 32nd Ward residents at the East Village Association meeting in the Happy Village, 1059 N. Wolcott. With the alderman's seat vacant in his neighboring ward, Ald. Scott Waguespack was asked if he was willing to mentor the next 1st Ward alderman. Waguespack didn't rule it out. But as a frequent critic of Mayor Daley, he suggested it was unlikely he'd be asked for advice on a City Council in which 19 of 50 members will be Daley appointees. A slowdown in commercial development prompted the alderman to ask EVA to meet with the Ukrainian Village Neighborhood Association and recommend the type of development he should encourage on their Damen Avenue border. "The market has given us a kind of reprieve in a good way to look at this issue," Waguespack said. A question on storm-water backup at Wolcott and Iowa brought a detailed discussion of city rain-blocker pipes. Waguespack said they quickly fail and must be removed. In his 42nd Ward office, he said, "we hire people to just go out and do it." With blue recycling carts popular in 1st Ward alleys, Waguespack said he is working with the city Streets & Sanitation department to add 42nd Ward carts along existing routes. "Anything we don't recycle we pay to have hauled off, so we're paying more not to recycle," Waguespack said. The 32nd Ward alderman voted in December against the 2010 city budget, which filled a $500 million deficit largely with proceeds from the $1.15 billion lease of city parking meters. Elected in 2008, he quickly got a chance to deliver on his reform agenda when he voted against the 75-year meter deal. Waguespack observed that a report last year from the city inspector general later confirmed his analysis. "You sold a city asset for $1 billion less than it was worth," Waguespack told the EVA group. "You essentially took it to the pawnbroker."